Google’s algorithms are evolving all the time. 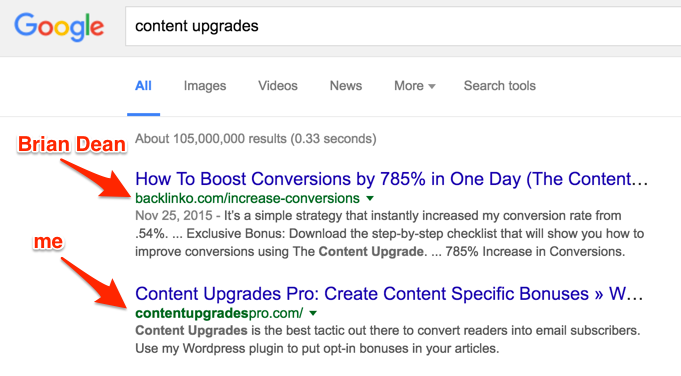 Back in the day you could “stuff” your page with a bunch of keywords you wanted to rank for and that alone would help to improve your rankings. This was of course very open to manipulation. But in 2016 we have Hummingbird, Rank Brain, semantic search and many other nifty technologies — Google has evolved far beyond just looking if you have a keyword in your Title or not. And besides, we’ve all noticed that pages often rank on the front page of Google without even having the target keyword mentioned anywhere in their content. The majority of on page SEO advice that can be seen around the web revolves around using the exact match keyword that you want to rank for in a few “strategic” places of your page: Title, H1, meta description, content etc. Isn’t this a great opportunity to rank with their own “perfectly optimized” page? The fact that these pages don’t have your exact match keyword in a bunch of “strategic” places, doesn’t mean that they are not relevant to the search query. 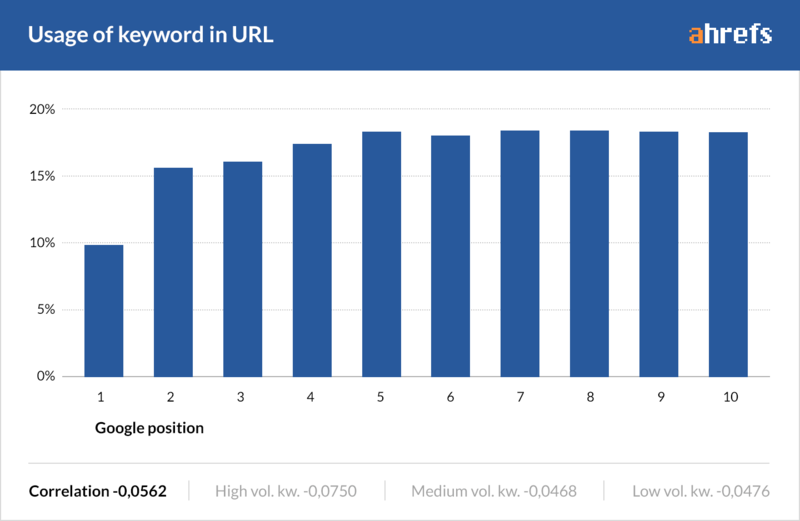 According to our data, the usage of exact match keyword in Title, URL, H1 or even within the actual content of the page doesn’t have a significant correlation with Google rankings. If we were to study “partial match” keyword usage, synonyms and “LSI keywords” (which we’re about to) — the results would most likely be different. 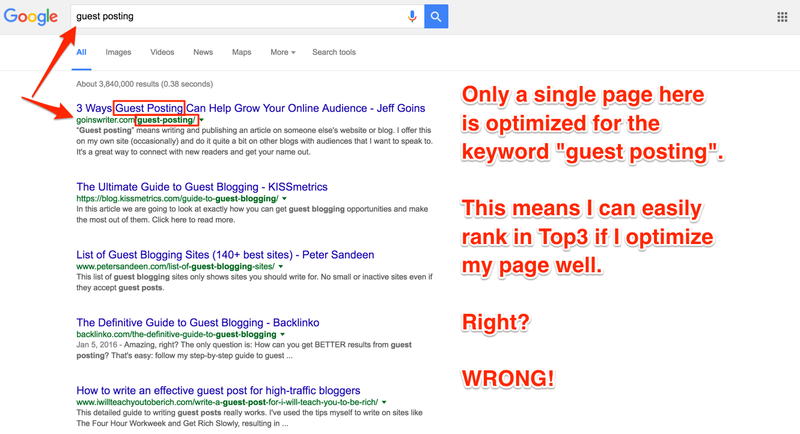 But “on page SEO” doesn’t end with using the keyword you want to rank for in the content of your page, right? At this point I’d like to mention one more time that correlation is not causation. Correlation is measured on a scale from –1 to 1 with “0” meaning “no correlation at all”. 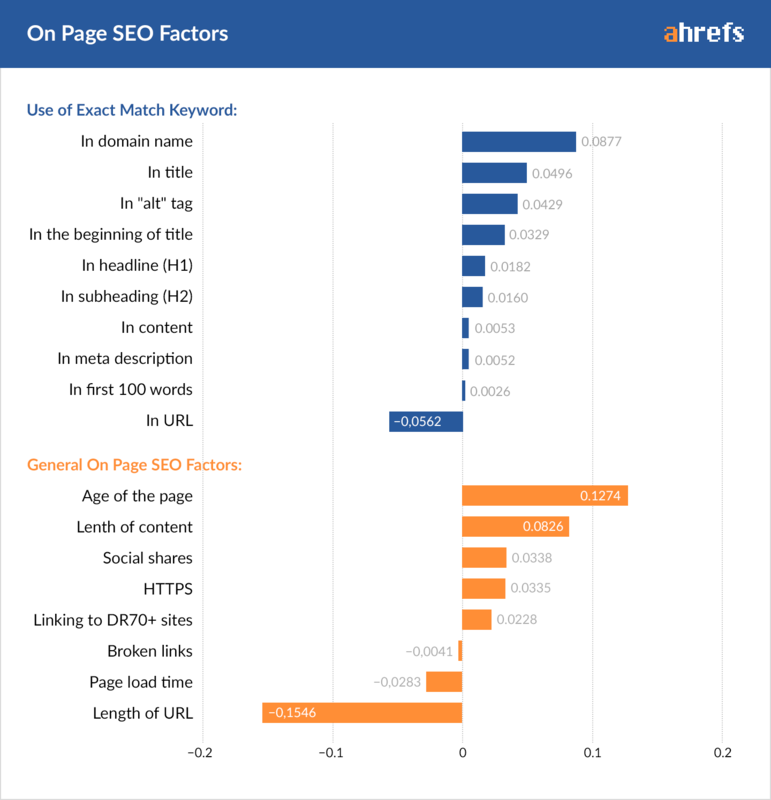 And as you can see, all the most popular on page SEO factors that we studied hardly reach 0.1 mark. You can clearly see that on page SEO factors that revolve around using an exact match keyword in “strategic” places of your page showed a very small correlation. We didn’t study the correlation of “partial match” keywords, synonyms and “LSI keywords” this time. But once we do — we will update this article with more data. 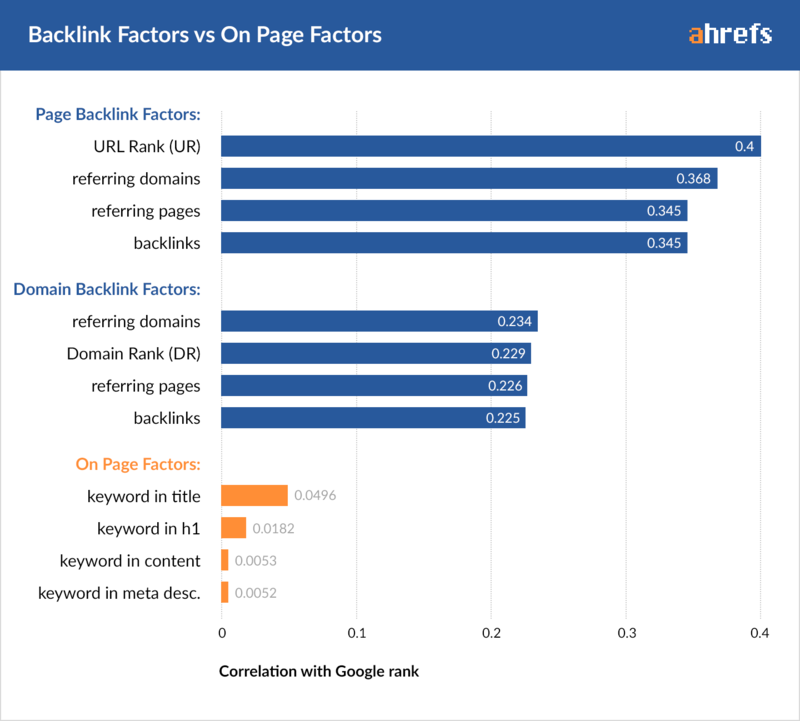 Such a huge difference in correlations suggests that backlinks have much more influence on your page’s rankings than usage of exact match keyword in the copy. 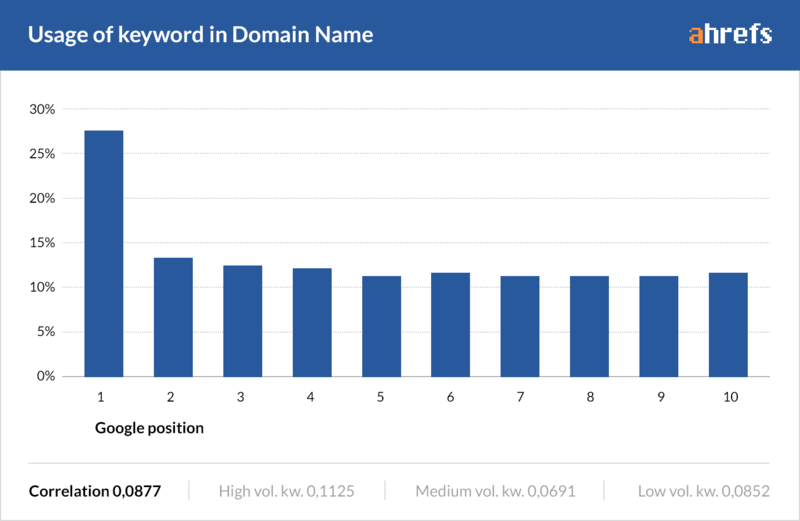 But even though our research data suggests that usage of exact match keyword on your page has a very low correlation with Google rankings, this doesn’t mean that you should completely refrain from using it. So let’s look at each on page factor one by one and discuss if you should or should not care about it. Our research was based on a sample size of 2M keywords, but there were times we had to reduce this number in order to study certain factors in isolation.For most of the below experiments we tried to exclude the influence of backlinks by focusing on SERPs where top 10 ranking pages had similar DR and UR (the standard deviation is less than 30% of their Average value). Low-volume keywords only (less than 20k searches per month). If you have any questions about the methodology behind any of the below experiments — just post them in the comments section at the end of this article (or tweet me @timsoulo). First of all let’s look at how using the exact match keyword in a few “strategic” places of your page correlates with Google rankings. TL;DR: all our experiments with exact match keyword usage in different places of a page(code) showed a very small correlation with Google ranking. Back in 2012 Google rolled out an update that was meant to decrease the value of the so-called EMDs (Exact Match Domains). By looking at our graph it may seem that EMDs are still in the game, because there’s clearly a “jump” in position #1. But I believe that this “jump” is caused by so-called “branded keywords”. The correlation of 0.0877 may seem pretty high (compared to other on page SEO factors), but if we were to re-calculate it without that #1 position I’m sure it would drop a lot. Please also note that we didn’t focus on EMDs exclusively, but counted any website that contained an exact match keyword as part of its domain name. Can you “coin” a certain keyword by using it in your domain name and building your brand around it?YES, you can! I did just that with my WP plugin called “Content Upgrades PRO” that resides under the “contentupgradespro.com” domain name. Is EMD a strong ranking signal? I don’t think so. Interestingly, out of all “keyword-related” on page SEO factors that we’ve studied this was the only one that showed a negative correlation. 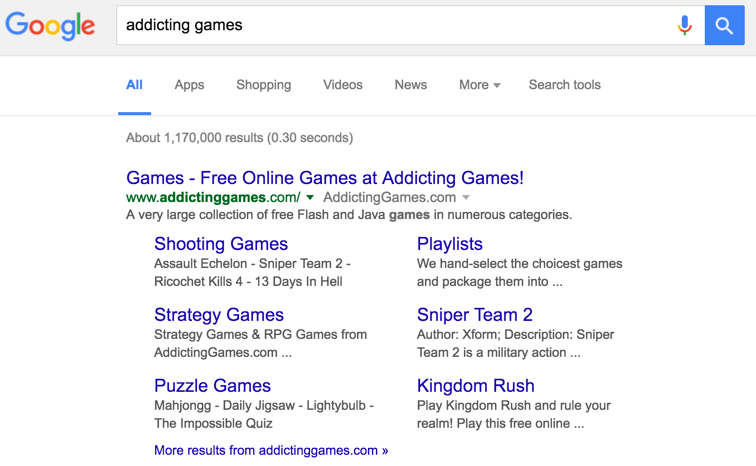 So does this mean that Google doesn’t use “keyword in URL” as a ranking factor? This article was originally written for ahrefs. Read the original article here. Tim is the guy responsible for marketing and product development at Ahrefs. But most importantly he’s the chief evangelist of the company.